What is natural endometriosis treatment? Natural endometriosis treatment with Dr. Bozinovski ND., may include any combination of lifestyle practices, dietary changes, specific supplements, and acupuncture. The most appropriate therapies are selected to eliminate symptoms associated with endometriosis, halt growth of endometrial tissue, optimize health overall and reduce risk of future disease. Each treatment protocol is individualized based on your particular symptom presentation, endometriosis stage (I-IV), and health goals. Natural endometriosis treatment is effective because it addresses the underlying cause of endometriosis symptoms. Endometriosis is a condition characterized by the growth of endometrial-like tissue outside of the uterus (most commonly, in the pelvic cavity). This tissue is fully functional and responds to fluctuating hormones. That means that it grows throughout the menstrual cycle and bleeds at menstruation. This causes significant inflammation, adhesions and scarring internally. Pain is the most common symptom and one of the most distressing. 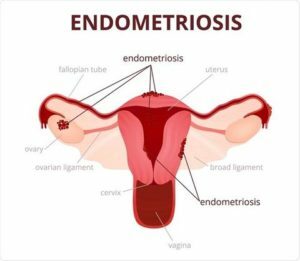 Interestingly, there is no connection between the severity of the pain and the severity of the endometriosis. Women are often told “It’s just your period….it can’t be that bad”, when they tell their doctor about their extreme menstrual pain. This not only dismisses a woman’s experience but it prevents her from getting the care that she needs. It’s my personal mission to change the way we relate to women around their reproductive health and especially the way we talk about periods & period problems. Endometriosis is something that I’m personally familiar with. I was first diagnosed with endo about 13 years ago. For many years I struggled with terrible pain and lots of other symptoms that I now understand are connected. I took pain medications and hormone medications for many years. They suppressed my symptoms for awhile but they made me feel worse in lots of other ways. Eventually, I developed a handful of other health issues as a result of the medication I had been taking. Finally I reached a point where enough was enough. I was ready for a new approach. That’s when I found naturopathic medicine. Naturopathic medicine completely changed my life and my health. I no longer fear my period. I no longer experience terrible pain. I finally feel in control of my body. I want the exact same for you too. We don’t know for sure what causes endometriosis, but the prevailing theory is that it’s an abnormal immune response to retrograde menstruation. Retrograde menstruation is when menstrual blood flows backwards and into the pelvic cavity. Over 90% of women will experience retrograde menstruation at some point in their lifetime. However the large majority will not develop endometriosis. The abnormal immune response in a certain subset of women appears to be the trigger for the endometrial tissue to become active vs. being eliminated by the body. One of the worst things about endometriosis is how long women go without a diagnosis. It’s estimated that 176 million women worldwide have endometriosis. However it takes an average of 7-10 years to be accurately diagnosed. The gold standard for the diagnosis of endometriosis is visual inspection by laparoscopy, preferably with histological confirmation. We don’t currently have a non-invasive diagnostic option for this condition. Though endometriosis is often assumed based on visual assessment during ultrasound in combination with symptoms. What are the next steps if I’m interested in natural endometriosis treatment? Book an initial appointment with Dr. Bozinovski by calling 416 214 0100. Complete hormone testing to identify which imbalances are contributing to your symptoms. Implement a naturopathic protocol to reduce/eliminate endometriosis symptoms, stabilize growth of endometrial tissue, and reduce risk of future disease. Natural endometriosis treatment will not only improve endometriosis symptoms, but will improve overall health and well-being. If you live outside of Ontario, the best way to receive endometriosis guidance from me is through my 8 week endometriosis program. I encourage you to learn more about this here. Please note that you don’t have to stop your medications or cancel your surgery if you want to receive natural endometriosis treatment. Dr. Bozinovski is an expert at making sure you have a treatment plan that fits your personal needs. Conventional and naturopathic medicine can work really well together.